Many people shop for a laptop with the first item on their list of wants being a matte screen for that lack of glare. Glare, or the reflection of light off glossy glass, is distracting and aesthetically displeasing to many. Glare means that you may be able to see the reflection of an interior setting in your PC screen, or can’t even see the screen outdoors in the sunshine. However, it is also an unavoidable price to pay for touch-sensitive screens or higher resolutions. Similarly, you can’t have an interactive LED display on your phone without also needing display-protecting glass. This also means you can’t watch a video or play a game as normal without also having to stare at your own silhouette on the screen. It would be great if someone could develop glass with reduced reflection and, thus, no glare. So, good news then: a team of researchers has developed a type of nano-scale coating that appears to do just that. The coating adds a texture to the glass that destroys its normal refractive index. Texture in glass should also impair its transparency; however, the researchers claim that their coating allows glass to remain see-through. The key term here is ‘truly invisible’, which is what glass treated in this way may become. The theory is that glare is caused by the sudden transition of light from one medium to another, namely from air to glass, which results in refraction. However, this nano-coating makes the ‘contact’ by external light on glass much more gradual, so that the refractive index changes much more slowly. This coating was developed by a team from the Center for Functional Nanomaterials (CFN) at Brookhaven National Laboratory in New York, and the Wellman Center for Photomedicine at Harvard Medical School. This team included Charles Black, the director of the CFN, Atikur Rahman, a professor of physics and Andreas Liapis, a Wellman Center research fellow. They published a paper based on their work in Applied Physics Letters. They claimed that their nano-coating could prevent the reflection of light in the 450- to 2000-nanometer range (which encompasses both visible and infrared light). This effect works even when the glass surface is viewed at off-centre angles, or so the researchers claim. Other types of reflection-killing coatings also exist. However, some commercial anti-glare products are only effective at one ‘viewing’ angle and wavelength of light. Therefore, researchers try to mimic anti-glare molecules that are found in nature. These include certain adaptations that occur on insect eyes or wings, so that their glossy surfaces do not reflect light and thus protect their owners from predation. Coatings based on this approach include silicon nano-structures, which are reported to reduce glare from approximately 34 percent (that of normal glass) to less than 1 perent. 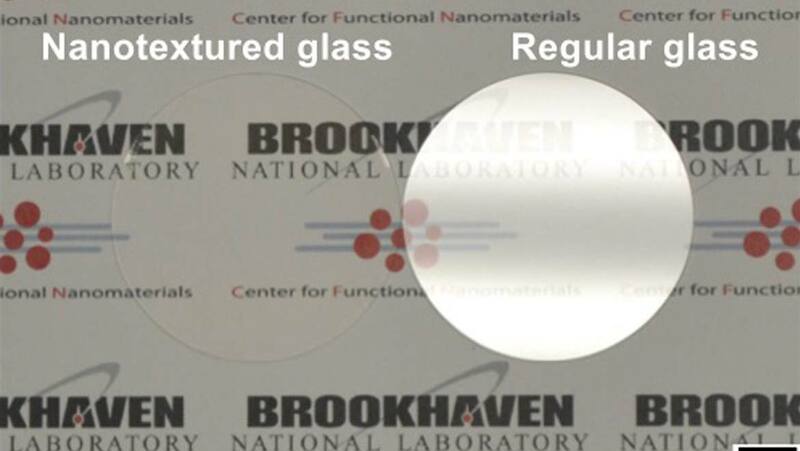 These coatings allow larger spectra of light to hit glass without refraction while allowing transparency at wider off-axis angles. These existing nano-coatings take forms (at the nanoscopic scale) such as cones or cylinders on glass surfaces. They are placed onto the glass using techniques such as nano-imprint and optical-interference based lithography. Unfortunately, these coatings are not commonly available yet. This may be due to the impaired ability of the lithography involved to adapt to a number of surface sizes or volumes – in other words, it’s difficult to scale them up or down. Therefore, it is difficult to get this kind of effective anti-reflection onto large panes of glass. The team decided to investigate the possibilities of molecular self-assembly, or the tendency of a polymer to form ordered patterns with other compatible molecules around it, in the production of a novel nano-coating. The materials involved are called block copolymers, and are already in industrial and academic use to create tunable, self-assembling thin films. They can be ‘set’ to form thin layers of nano-patterns with certain inter- and/or intra-molecular bond-lengths. The patterned sheets they form that stretch over surfaces up to about 1 square meter in dimension. The team’s self-assembled coating consisted of regular hexagonally-arranged cylinders of poly(methyl methacrylate (PMMA) within a polystyrene (PS) matrix. It self-assembled into this conformation as a result of thermally-driven phase separation, from a ‘first form’ of (PS-b-PMMA) block copolymer, which was placed as a film on a fused silica substrate. The PMMA hexagons were then ‘filled in’ with aluminium oxide as a result of a reaction between tri-methyl aluminium and water vapour. Oxygen plasma was then used to eradicate the PMMA, leaving 20nm deep hexagons of nano-aluminium oxide that were in a pattern with a 52nm gap between each hexagon on the surface of the silica. The aluminium was then etched away in a process that left the silica with pointed nano-cones at a density of ∼4.6×1014 per meter squared. Their pattern was uniform over the 5cm fused silica wafers the team used to assemble their nano-coating. They found that cones of 280nm in height gave the best modulation of refraction. All in all, glass coated using this process exhibited a reduction in reflections on both sides of the glass to under 0.2 percent for all applicable wavelengths of light. This non-reflective glass is not just beneficial to users of consumer electronics. Solar panels may also need protective transparent coverings; however, they lose potentially convertible energy to refraction as a result. Nano-textured glass could represent vast improvements in solar-cell function and performance, which benefits consumers and the environment. Black and his team believe that their nano-coating could add as much as 8% to the performance of photovoltaic devices. They also point out that ‘truly invisible’ glass is better for work that involves pulsed-laser applications. This ‘truly invisible’ glass should be an industrially-accessible and scalable path to nearly non-reflective glass for future fittings and devices. Liapis AC, Rahman A, Black CT. Self-assembled nanotextures impart broadband transparency to glass windows and solar cell encapsulants. Applied Physics Letters. 2017;111(18):183901.